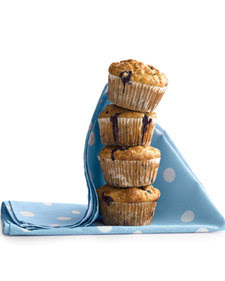 This month's Living magazine featured a few recipes for healthy muffins. I LOVE muffins so I immediately clipped out each recipe. This morning I made the Banana Blueberry Cornmeal muffins. They were so tasty I ate 5 throughout the morning. I enjoyed them guilt-free too because the recipe calls for zero butter and zero oil. However, somehow the muffin manages to stay moist and is of the perfect density. Go figure. Click here for this morning's recipe.